farmhouse, it takes me a minute to register what’s missing: power lines. know whether to expect a handshake or the barrel of a Winchester. intimidates me in a way that others never have. many lessons I would learn doing business in Amish communities. a classic that is treasured and passed from one generation to the next. and usually don’t take no for an answer. a person in important ways. simplicity and honesty, and their emphasis on community. had something to offer the rest of us. It turns out it does. proprietorships, often in direct competition with one another. and in other areas they’ve had resounding success. question. His terse reply: ‘‘I don’t have any words of wisdom.’’ Full stop. the terminology, would he continue to offer his thoughts. something else’’—God, employees, good fortune. of success itself can vary somewhat from the popular perception. course, the ultimate: getting everyone into heaven. reduce costs in areas such as hiring and firing. can learn lessons for businesses in any culture. relevance for modern business owners as well. As I researched Amish business success, a few key concepts emerged. Foremost are two: Business is a vehicle for something more important. companies, and other members of the community—to achieve success. learn, market, and manage, all while keeping these concepts in mind. they may sound like any neighbor. prefer ‘‘talking Deitsch’’ or just plain English. 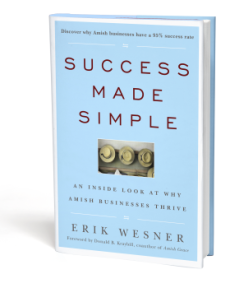 Excerpted from Success Made Simple: An Inside Look at Why Amish Businesses Thrive by Erik Wesner Copyright© 2010 by Erik Wesner. Excerpted by permission of Jossey-Bass, a division of John Wiley and Sons, Inc. All rights reserved.